Dr. Heidi Hosley is at the National Alliance for Grieving Children conference, where she connected with Sheila Munafo Kanoza. Kanoza was widowed 22 years ago after her husband died following his cancer battle of ten years. She had three children, and couldn’t imagine how she could move on. She prayed for God to take her, and eventually asked what she was supposed to do with her life. She got the message that she was supposed to join a bereavement center, although she had no idea what that was at the time. She looked it up, and found that to be bereaved means to be robbed. First, she needed to heal as a mom before caring for her children. She’s traveled all over the US taking numerous trainings. 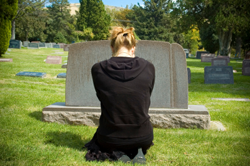 She transitioned from the business world to the bereavement industry. Now a leader in the field, she works with hundreds of teens each month, sharing her story and using the mass knowledge she’s accumulated to help others heal. A life of service is a common healing mechanism among the bereaved, and one that works exceptionally well for many. Now, her organization is in 21 schools and also works with adult support groups. If you don’t work with the family, and if an adult is crippled, how can you expect a child to not be crippled? Kanoza uses her own story to help other families who are walking in her footsteps. She’s found, personally and professionally, that what helps families after a loss is to have someone who will listen. You need someone who will be present. It’s often common to use the spiral of strength to gauge where you are when someone dies. You’ll bottom out, but you’ll spring back up if you have the right support available. It takes time, so find what brings you up.